Documents save automatically to OneDrive while you work in Word Online. Saving a copy of your document online means you'll be able to work on the copy in Word Online. While you're editing your document (in Editing View), go to File > Save As, and click Save As, and then save a copy with its own name. OneDrive automatically keeps track of the previous 25 versions of a document, so you might not want to store multiple copies. 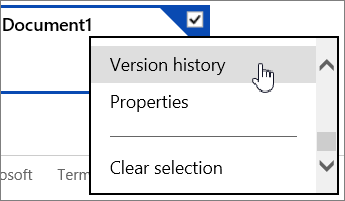 To restore an older version, right-click the document on your OneDrive site, and click Version history. To change the name of your document quickly, click its name in the title bar and type a new name.